Trailhead is on Gulf Road in Chesterfield, NH (summit is in Hinsdale). To get there, take Stage Road from Rt. 63, 1.6 miles south of Rt. 9. Drive 0.2 miles and bear left onto Castle Road. Continue 1 mile to where Castle Road ends at Gulf Road. Turn left and follow Gulf Road 1.9 miles to the parking area on the left, which is marked with a Forest Society Sign. The Forest Society's Madame Sherri Forest encompasses an area of scenic woodlands centered around Indian Pond. 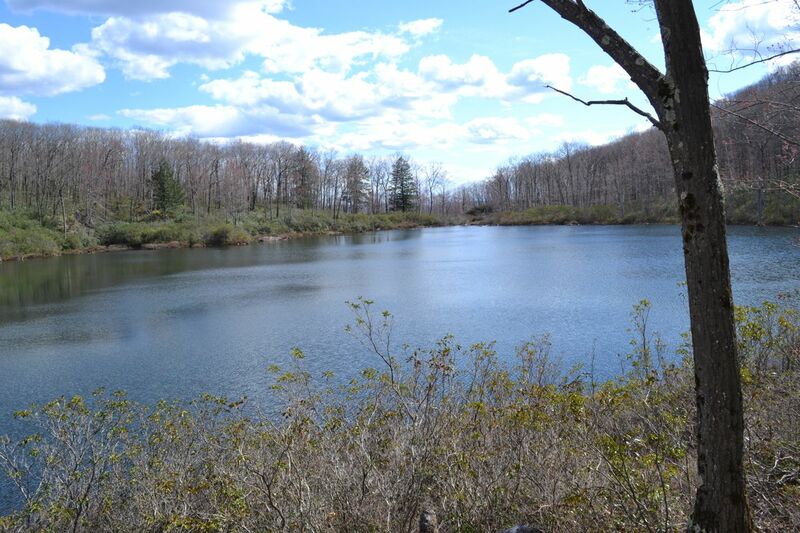 This enjoyable loop hike visits several viewpoints and the pond. The Ann Stokes Loop begins at a small marsh, crosses a bridge, and immediately forks. Here, turn right on a short spur to see the ruins of Madame Sherri's castle (read about the castle's history on the Forest Society's website). Among the ruins are a stone floor and a staircase above a set of arches. The main trail turns left to continue beside the long marsh. The marsh soon ends, and the path leads away. At 0.2 miles, bear left onto the east branch of Ann Stokes Loop. It gradually begins to climb uphill and soon leaves the Madame Sherri Forest. In 0.8 miles from the junction, it arrives at the beginning of the Daniels Mountain Loop. Turn left onto the north branch of this loop. The trail leads under a series of rock ledges (called the O'Neil Ledges), makes a sharp right turn, and leads to the top of the ledges, where there is a small outlook toward nearby East Hill and Wantastiquet Mountain. The trail continues through a patch of mountain laurel and leads across the broad top of Daniels Mountain. It crosses the viewless summit 0.6 miles from Ann Stokes Loop, where Daniels Mountain Trail diverges left. Turn right to stay on the loop trail and gradually descend 0.4 miles to Moon Ledge, where Bear Mountain Connecter enters from the left. A spur path leads out to the ledge. This grassy clearing on the south side of the mountain presents a wide view into Massachusetts and Vermont. From Moon Ledge, the trail continues its descent back to the start of the loop, reached in 0.4 miles. Turn left on Ann Stokes Loop. It travels easily through the mostly flat forest, then climbs to the summit of rounded East Hill 0.7 miles from the last junction. Just off the trail to the right is a fine easterly view. The trail now descends steeply on the other side of the hill. About halfway down, a ledge overlooking Indian pond is passed. Mine Ledge Trail heads off to the left in 0.2 miles from the summit. Turn left onto this trail, then turn left again onto a spur to the shore, where there is a good view over the peaceful blue waters of Indian Pond. To complete the loop, return to the trail and continue on Ann Stokes Loop. It descends easily, soon joining a brook, which it follows back to the loop junction, 0.4 miles from the pond.